Publisher Desc. A substantive collection of 17 hymn settings written with today's busy organist in mind. Selections span the church year and the arrangements are set in a variety of forms: preludes, postludes, meditations, improvisations, hymn introductions and free harmonizations. 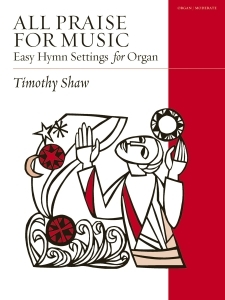 This is Timothy Shaw's first collection for organ, following the success of his collections for piano Titles: Blantyre; Soli Deo Gloria; Blotten tag; Dix; Foundation; Hanson Place; Holy Manna and Lyons.